I am writing to you to express my deep distress and concern regarding your choice of the recent winner of the Elsie Locke Award for Children’s Non Fiction. I believe that my grandmother, were she alive today, would be deeply shocked and offended by the selection of Maria Gill’s ‘Anzac Heroes: 30 Courageous Anzacs from WWI and WWII’. Elsie Locke fought hard for the causes of peace and social justice, and this struggle necessarily involved a considered opposition to war propaganda and war glorification. Maria Gill’s book is a textbook example of ‘Anzackery’, the sentimentalised and militarised version of Anzac remembrance which currently dominates the school system and the mainstream media. I struggle to find a suitable analogy for the contrast between the book and my memory of Elsie Locke. “Chalk and cheese” metaphors do not begin to describe the intellectual and spiritual dissimilarity between the two. Imagine a parallel universe in which Winston Peters had some connection with children’s literature and had his name bestowed on the award instead of Elsie Locke. Consider the inappropriateness of this Winston Peters Award being given to a book about, say, ‘Chinese Heroes: 30 courageous immigrant stories’. Multiply that inappropriateness by a factor of one hundred or so, and you will have some sense of the contrast and contradiction your recent decision has created. That’s a quote from Chapter 40 (‘Anzac Days’) of Elsie Locke’s book ‘Peace People: A History of Peace Activities in New Zealand’. The rest of the chapter is about how anti – Vietnam war protestors mobilised against the reactionary imperialist sentiments of Anzac day to further the causes of peace and social justice. Had Elsie Locke ever written a book about New Zealand war veterans, it would very likely have included Ormond E Burton. She would likely have quoted passages from his book The Silent Division, which vividly portrays the horrendous and inhuman reality of the trenches of WWI. Had she written the book for a younger audience she would have had the highest respect for the natural inquisitiveness of children. Why was New Zealand involved in such a far away war? Did everyone support the war? What effect did it have on women and children? What happened to the soldiers when they got home? Why were we fighting the Germans? Who benefitted from the war? It is exactly these sorts of pertinent and critical questions which are completely and utterly lacking from Maria Gill’s book ‘Anzac Heroes’. Rather than looking at WWI and WWII in a broad social and historical context, Gill takes the perspective of military history. What’s important is battles, and in particular Heroes. Each Anzac Hero gets a full two page colour spread. They pose heroically with guns or binoculars or stethoscopes. We learn about all the medals they received, and detailed timelines tell us about the battles they fought. There are maps showing the details of military manoeuvres, historical photos showing scenes from the trenches (without a speck of blood) and a glossary at the end of the book with entries like ‘adversary’, ‘flak’, ‘booby trap’ and ‘garrison duty’. There is a cartoonish and commercial quality to the presentation. It is easy to imagine a very similar looking book describing ‘Star Wars’ heroes, with detailed diagrams of the Death Star and hyper-real pictures of Luke Skywalker and Han Solo posing next to their spaceships. Buried at the end of the book in the ‘Medics’ section is a table of casualties, accompanied by a small amount of text which describes some of the horrific injuries suffered by the soldiers. This token recognition is massively outweighed by the dominant tone of the book: it’s about Brave Soldiers and exciting War Stories. 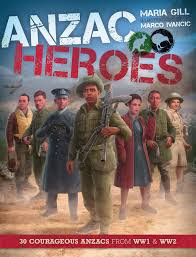 ‘Anzac Heroes’ is a 21st century Boys Own adventure, a history lesson for 12 year old boys who want to continue playing with toy soldiers with all of their illusions intact. History is reduced to the violent acts of men in uniform, and the violence itself is cloaked behind a sentimental narrative of bravery and sacrifice. Let’s recall those words of my grandmother once again: ‘Fighting for one’s country was regularly emphasised as a virtue in itself, with no questions raised about why the men were called upon to fight, or whether their sacrifice was necessary.’ This book clearly exemplifies this attitude exactly: it glorifies the bravery and character of the people who fought without any sort of critical thinking about why they fought. This reverential and sentimental approach towards our history is noxious. It not only fails to engage in any sort of critical thinking about war, it effectively encourages a moral prohibition on such critical questions being posed. Respect for bravery and sacrifice prevent us even considering the difficult questions around the impact of violence, war and politics. I have spoken to other members of my family who also feel that the award is offensive and inappropriate. It has been pointed out that Elsie deeply respected the values of autonomy and free speech. So it would be appropriate and honourable for us as a family to not interfere or prejudice your decisions as judges of the award, to avoid any form of what might be judged to be censorship. Freedom of speech goes both ways however, and I will be exercising my right to express my critical opinion on this book loudly and publicly. German planes bombed Reg’s ship and he made a lucky escape from the wrecked boat. When he arrived in Crete, he had only the clothes he wore and nothing else. After thousands of enemy paratroopers parachuted into Crete, Reg’s battalion was meant to replace 20th Battalion, which had counterattacked Maleme airfield, but arrived too late to succeed. They withdrew to the new frontline at Souda Bay, nicknamed 42nd Street. When a raiding party of 400 Germans stumbled into sight, the Anzacs called out a battle cry, firing as they ran, thrusting their bayonets at the enemy. The German fighters fled for their lives. This is a quote from page 68 of Maria Gill’s “Anzac Heroes”, and it gives you an idea how exciting this book is to read. ‘Reg’ is Reginald Saunders and there is a really realistic picture of him in uniform holding a massive machine gun over his shoulder, the same image is on the cover. We can scan the page and very easily tell exactly what medals he was awarded for his bravery. The coloured medal icons are listed in the helpful “medals” section at the back of the book. We can also tell very easily which of the five aspects of History Reginald took part in: the little tank icon means ‘Army’. (The other four aspects are Air Force, Intelligence, Medic and Navy). A helpful kangaroo icon tells us that he is Australian. Sometimes when reading ‘Anzac Heroes’ it’s a bit confusing which hero belongs to which war, WW1 or WW2. After all, the Germans were the Baddies in both wars. I figured out though that Reginald belongs to WW2, as page 68 belongs to the second half of the book. There’s a really cool map with lots of arrows on it half way through the book to show that we are moving from WW1 to WW2. There’s a boring timeline too with lots of dates and facts about which battle was which, but I preferred to skip this part and just focus on the really cool war stories. Some really racist and sexist books about war focus just on heroic white men. Anzac Heroes doesn’t do this, it has several brown heroes (both Aboriginal and Maori) and several women. The women aren’t quite as cool as the men because they only get to be nurses or spies. The Aboriginal and Maori soldiers are really cool though, they were really brave and sometimes scared the Germans by doing Hakas and war dances. Actually, even though there were lots of racist people back in the old days, war was really good for Maori and Aboriginal soldiers. Soldiers like Reginald Saunders got lots of awards and like it says on page 69 the RSL even set up a scholarship in his name for Aboriginal people. Another example is the Maori soldier Lt Col Sir Peter Buck who proved how awesome he was in Gallipoli and then got to be second in command of the Maori Battallion and then became a famous anthropologist. At the beginning of the 20th Century, New Zealand and Australia were part of the British Empire as self-governing Dominions. When Britain went to war, they committed themselves to defending Empire. Politicians worried that the war would spread to their shores and wanted to support the Empire’s effort to prevent that from happening. So I think that the moral or the message of the book is that Anzac Heroes needed to fight the Germans so that they didn’t land in Australia or New Zealand and take over our countries. If it wasn’t for the brave and daring fights that they got into, we’d all probably be speaking German now and doing Nazi salutes. So in conclusion I think Anzac Heroes is a really good book which belongs on the bookshelf of every New Zealand and Australian home. It’s got lots and lots of important facts about heaps of battles from WW1 and WW2 and also some really realistic pictures. It has a personal touch which means it isn’t boring to read and also it is very moving and emotional because of the sacrifices made by the Anzac soldiers. Lest We Forget. The recent publication of the Defence White paper, with its announcement of an extra $20 billion to be spent on the military over the next fifteen years, has not raised a huge amount of controversy. With the exception of a small number of critical commentators, the reception of this massive funding increase has been on the whole fairly positive. None of the major political parties have come out against the major thrust of the paper. Phil Goff, the Labour Defence spokesman, has criticised the paper for its lack of specifics, but clearly supports the idea that our military forces need much more money. Ron Mark from New Zealand First complains that $20 billion is not enough, and worries about the military effectiveness of the spending decisions to be made. No one questions the received wisdom: New Zealand spends a pittance on its military forces, they are well over due for some extra funding. The statistic that gets trotted out repeatedly is the (supposed) fact that New Zealand spends just 1% of its GDP on defence. Compared to other countries this is very small. Our nearest neighbour and ally Australia spends closer to 2%, the United States spends around 3.5%. As an ally and trading partner, New Zealand should ‘pull its weight’ and share a proportional military burden. Putting to one side the important and controversial question of whether New Zealand should ally itself with these or other much bigger international players, is it true that we spend just 1% of our GDP on defence? Is this the most appropriate way to measure our military spending? The claim is almost true for the past decade. Following an international trend beginning at the end of the cold war, New Zealand decreased its military spending over the course of the 1990s. Whereas the United States drastically increased its military spending in the wake of 9/11, New Zealand’s spending (as a % of GDP) decreased gradually to a level of around 1.1 – 1.3% of GDP, where it has floated steadily since around 2005. Two points need to be made about this statistic. First, it doesn’t mean that New Zealand has been spending roughly the same amount of money each year on defence. As the economy grows, even tiny looking percentages grow proportionally. In 2012 for example, New Zealand spent 1.2% of its GDP on defence, just under $2.586 billion dollars. In 2015 it spent the same 1.2%, which was then worth $2.956 billion. That’s an increase of $370 million. Inflation accounts for some of this, but we are looking at huge increases over and above basic inflation rates year by year nevertheless. Secondly, tiny looking increases in percentage figures are huge when they are taken from gigantic sums such as national GDP figures. According to Statistics New Zealand, New Zealand’s GDP for the 2015 year was $245 billion. One percent of this sum is $2.45 billion. Each 0.1% increase is worth $245 million. It is not pedantic or obsessive to look closely at these apparently minor differences, these hundreds of millions of dollars would have a massive impact in any area of New Zealand’s small economy. The claim that New Zealand spends just 1% of its GDP is absolutely false for the year 2016. According to the official budget statistics, New Zealand will spend a total of $3,695,573,000 on defence in 2016. This figure does not contain any of the $20 billion mentioned in the white paper, so the true total will be much higher. Even if we ignore the extra $20 billion, this amount works out to 1.46% of GDP. Not too far behind Australia’s figure for 2015, 1.92% of its GDP. If we try to take the extra $20 billion over fifteen years into account, we get a much bigger figure. No details about when and exactly what the $20 billion will be used for have been released, so we don’t know how much, if any, will actually be spent in 2016. Although assumptions can be dangerous, if past history is anything to go by the safest assumption to make here would be that the planned $20 billion will in reality blow out to a much larger sum. I’ll make the conservative assumption that it doesn’t, and also that it will be evenly spread out over the fifteen years. That results in an additional $1.333 billion for 2016, bringing the grand total military expenditure to over $5 billion. As a percentage of GDP, that is 1.99%. Should we focus on military spending as a proportion of GDP? Although this statistic is useful when you are comparing different countries with each other, it does not help us understand the impact military spending has on our domestic economy. A much more relevant statistic for this purpose would be military spending as a proportion of total government expenditure. Five billion dollars is a chunky 5.59% of total government expenditure. Comparing this to what we spend on health and education, the impact of preparing for war is very apparent: defence spending is almost one third of the entire health budget, and just under a half of the entire education budget. There are two types of justifications used by the legions of media commentators who heartily approve of New Zealand’s increased military budget. The first is a liberal- humanitarian green tinted justification, which emphasises local responsibilities in the Pacific region. We need bigger and better planes for disaster relief, better boats to defend against illegal fishing in the Southern Ocean. In a recent Stuff article, Stacey Kirk writes about the need for New Zealand’s Defence Force to “target sights closer to home”. The picture just below the headline shows a group of Adelie penguins on an iceberg in Antarctica, with the caption “If it's not scientific research and conservation, then New Zealand has to play a part in looking out for these little guys”. The second approach emphasises the dangers facing New Zealand in the international arena, and the need to protect ourselves from a wide range of threats. In a recent interview with Paul Henry, a visibly excited and somewhat swivel-eyed Patrick Gower declares that “New Zealand has a new enemy”. China has developed a 100,000 strong army of cyber soldiers, who regularly attempt to hack the computers of the New Zealand government. To play its part in the “global war games” New Zealand must spend a “small fortune” on something called “cryptographic infrastructure”. Neither Paul Henry nor Patrick Gower know what this is exactly, but speculate that it is “some kind of software”. Underneath all of the spin, this is the most significant and convincing reason for New Zealand’s increased military budget. Cute penguins, illegal fishing, tropical cyclones and even Gower’s army of Chinese cyber warriors provide comfortable and predictable click-bait for the superficial observer of New Zealand’s military spending. The real reason has to do with the New Zealand state’s relationship to its much bigger imperial partners, Australia and the United States. The crucial and complex question of how these historical loyalties relate to the overall geo-political situation, in particular the question of how New Zealand has an ambiguous and contradictory stance regarding China, I will put to one side and refer to Gordon Campbell’s excellent recent article. The 2% of GDP target is also a political hot potato for the European countries in the NATO coalition. Only five of NATO’s 28 countries spend more than 2% of their GDP on military expenses: United States, Britain, Poland, Estonia and Greece. In 2006 all of the NATO countries agreed to a 2% target, with the United States pushing the hardest for member countries to increase their military spending. In more recent years, especially since the conflict between Russia and the Ukraine, pressure from the US has increased. Obama has been particularly vocal on this issue, which has managed to strain even the ‘special relationship’ between Britain and the US. Hillary Clinton, Bernie Sanders and Donald Trump all agree with Obama on this issue, and urge NATO countries to spend more money on their military forces. This pressure to spend more and more money on 'defence' is part of a broad international pattern of increasing military expenditure. Although there is no explicit publicly announced pressure on New Zealand to meet a 2% of GDP target, with Australia striving for and surpassing that goal, and the US putting pressure on European countries to meet that same goal, it is easy to imagine New Zealand political leaders worrying about what Obama thinks of their military contribution. When the government of the day is one which clearly could not care less about things like the housing crisis, refugees or paid parental leave, and slavishly fails to depart from its allegiance to US imperial interests and entanglements, it is not surprising that New Zealand is following the crowd in spending more money on its military. I have been meaning to write here for some time, but for various reasons it just hasn't happened. Top of my list is to write about the year 1916 - the year of the first Anzac day commemoration, and also the year conscription was introduced. It's a dark and shameful year in New Zealand's history, in which the rhetoric of sacrifice is the driving force behind the move to introduce compulsory military service. Was the first Anzac day commemoration a significant part of this lead up to the introduction of conscription? How did people opposed to New Zealand's involvement in the imperialist slaughter deal with the emotionally charged atmosphere of the time? Hopefully I will have the time soon to do justice to these questions. Not only does Te Papa seek to re-sell the “grand adventure” story all over again, but to bond us to it, have us identify with it. Through the uniforms you can don, the questions you are invited to answer, the poppies you can leave heartfelt messages on – but also through its insistence on speaking in the first person plural. It’s the scale of “our” war. “We” were in Egypt when they told “us” that “we’d” be invading Gallipoli. “The Turks had sided with the Germans in the war, and we were itching to take them on… that’s where the action was.” That text is not even quoted from a letter or a journal. That’s just Te Papa speaking – as your quintessentially Kiwi, male war hero “mate”. There’s a real sense of optimism and excitement after the massive protests against the TPPA signing in Auckland recently. I’ve taken part in several anti TPPA protests myself, and it’s been great to see the movement building strength and momentum. The standout feature of these protests has been their vociferous and disruptive militancy: roads are blocked, arms are linked and dildos get thrown. There is at the same time a debate going on about the appropriateness of various tactics used, with a great deal of anxiety around the issue of ‘violence’. I’m firmly on side with the rude disrupters on this issue, and it’s fairly easy to draw a line connecting these dots: fences broken and rugby fields occupied in 1981, nuclear ships and subs challenged by fleets of boats and canoes in 1985, motorways blocked by TPPA protestors 2016. All of these non violent protest actions are the embodiment of principled passion, they are ‘rude’ in-your-face gestures intended to wake people up. When it comes to Anzac day, these sorts of confrontational protest gestures don’t always work. The most recent high profile Anzac protest was in 2007, where Valerie Morse and others burnt a New Zealand flag during the dawn service. Morse and others instantly became the subject of righteous and indignant outrage, and although the protest was brave and principled, it did not have the desired effect. With these thoughts in mind I was pleasantly surprised to read about an anti-TPPA protest action in Te Papa museum, in which Renee Gerlich and Pala Molisa draped a massive banner over the “Gallipoli: The Scale of our War” exhibit. The words now read “Our Imperial War”, and were accompanied by a picture of Archibald Baxter – ‘We Will Not Cease – TPPA No Way!’. With the streets of Auckland blockaded on the same day, and dildos being thrown just a couple of days later, this creative and provocative protest didn’t get much coverage. One News picked it up, and fairly predictably packaged the story using the tweeted outrage of a talkback radio host: “Extremely Disrespectful TPP protestors target Anzac Exhibition”. Someone told Cameron Slater about it, and (again fairly predictably) the slimy bowels of the Whaleoil comments section spat threats and abuse against Gerlich. Renee was surprised by the immediate response: embarrassed and decidedly non-angry security guards escorted her away from the scene, no charges were laid. 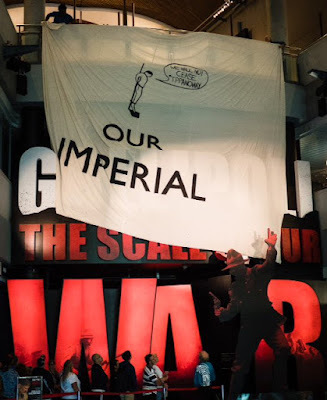 She also made the point that by using Te Papa as the site of her protest, she was being faithful to what public museums should be – places where dialogue about the past can occur, as opposed to the monolithic sentimentalism of Peter Jackson’s Gallipoli. Gerlich concludes, “So it gives the lie to this ‘democracy’ line. It is unacceptable for our government and social institutions to be glorifying the deaths of thousands of soldiers for a cause they are at the same time prepared to completely undermine. I’m impressed by the connections this action makes between the militaristic imperialism of WW1 and the economic imperialism of the TPPA. Finance capital, transnational corporations, nation states and power politics: books and academic theses can and have been written on these topics, just as the TPPA has already generated an intricate and sophisticated discourse about its economic and political implications. The image of Archibald Baxter cuts through the obtuseness of economics and history: a working class farmer who says No to great Powers, someone who will not cease from mental fight. As a protest icon Baxter was very significant during the Vietnam war era, so why not draw on his legacy now in 2016? The speech bubbles read "If we died for democracy then why is New Zealand now being sold?". Threatened with arrest by the police for the use of Disrespectful Stickers, this protest didn't last too long but still deserves recognition. I’m hoping to have this article up to a publishable standard by early next year, but until then here is a draft version of the first part on A R Barclay and the Boer war. This is just a blog, so I can theoretically say anything I want, but with this sort of thing I strive for factual accuracy. If anyone reading this can spot a mistake, or would like to make any comment at all, please leave a comment or email me. Archibald Baxter’s We Will Not Cease is rightly famous as an incredibly powerful pacifist statement. Of the fourteen conscientious objectors who were forced on board the troopship Waitemata in 1917 and taken to the trenches, Baxter is the only one who wrote a memoir. 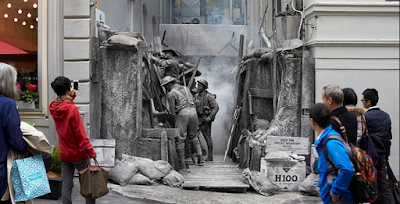 Out of the thousands of New Zealanders who resisted the pressures of the hegemonic pro – war forces in the years between 1914 and 1918, Baxter was one of a small handful who actually experienced the horrors and brutality of the trenches in Europe. This year New Zealand and Australia commemorated the 100th anniversary of the Gallipoli campaign. One hundred years ago thousands of Allied troops invaded what was then the Ottoman Empire on April 25th 1915. The ensuing eight month battle was a grim and bloody affair fought within a tiny section of the Mediterranean coastline. Casualties were heavy on both sides, with the number of Turkish / Arab deaths being by far the highest. It was the first major battle the newly christened 'Anzac' soldiers had been involved in, and the large number of deaths had a profound impact upon the people of New Zealand and Australia. The following years of battle took an even heavier toll, but this first shock assumed a sort of mythic status, and now the date of April 25th is the focus of WW1 commemoration in New Zealand and Australia.